The incidence and significance of livestock trace mineral deficiencies and toxicities in Latin America are described briefly, together with appropriate detection techniques and preventive methods. Inadequate trace mineral nutrition is obviously limiting livestock production in Latin America. Although provision of mineral supplements to grazing ruminants is more complicated than for monogastric livestock, mineral supplementation represents low input/high output nutrients for greatly increasing livestock production; indeed, no single factor has as much potential to increase Latin-American livestock production at low-cost input as adequate mineral nutrition. Throughout Latin America nutritional disorders account for a major segment of the factors limiting productivity of livestock. Wasting diseases, loss of hair, depigmented hair, skin disorders, non-infectious abortion, diarrhoea, anaemia, loss of appetite, bone abnormalities, tetany, low fertility and pica are clinical signs often suggestive of mineral deficiencies throughout the world. The extent to which a lack of sufficient energy and protein is responsible for these clinical signs is still largely unanswered. 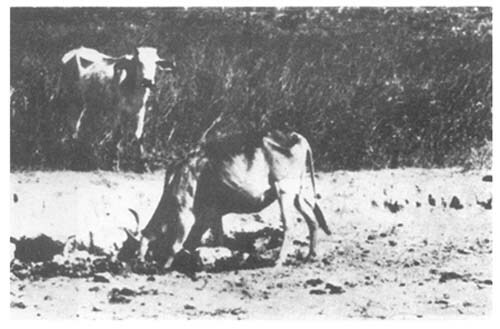 However, numerous investigators have observed that livestock sometimes deteriorate in spite of an apparent adequate feed supply (Sutmöller et al., 1966). Ruminants grazing forages in a severe cobalt (Co)- or copper (Cu)-deficient area are even more limited by lack of these elements than either that of energy or protein. The authors are members of the Department of Animal Science, University of Florida, Gainesville, Fla. 32611. This article appears as Florida Agricultural Station Series No. 671. Seven trace elements are generally accepted as essential for livestock, including Co, Cu, iodine (I), iron (Fe), manganese (Mn), selenium (Se) and zinc (Zn). In specific areas toxic concentrations of Cu, fluorine (F), Mn, molybdenum (Mo) or Se limit livestock production. The significance of additional toxic elements (arsenic, lead, cadmium, mercury and aluminium) as well as the “newer” trace elements, chromium, fluorine, vanadium, molybdenum, nickel, silicon and tin, have been reviewed (Underwood, 1977). Underwood (1977) presents a comprehensive description of the many diverse functions of trace minerals as well as specific clinical signs of deficiencies or toxicities. This review will emphasize the incidence and significance of trace mineral deficiencies and toxicities in Latin America and methods for their detection and prevention. Factors influencing mineral requirements. Trace mineral recommendations and toxicities for selected classes of livestock are presented in Table 1. Many factors affect mineral requirements, including nature and level of production, age, level and chemical form of elements, interrelationship with other nutrients, mineral intake, breed and animal adaptation. The trend toward complete confinement and absence of pastures for poultry and pigs has greatly increased the incidence of trace mineral and other nutrient deficiencies. Improved management practices that lead to improved production and growth rates for livestock and poultry necessitate more attention to trace mineral nutrition. On the basis of low mineral concentrations in tropical forages during the dry season, it is logical to assume that grazing livestock would most likely suffer mineral inadequacies during this time. On the contrary, many world reports, including those of Brazil, Kenya and the Republic of South Africa, have noted specific mineral deficiencies more prevalent during the wet season (McDowell, 1976). During the wet season livestock gain weight rapidly since energy and protein supplies are adequate, and thus mineral requirements are high. However, during the dry season, inadequate protein and energy result in animals losing weight, which lowers mineral requirements. Factors affecting plant mineral content. The concentration of mineral elements in plants from diverse regions in Latin America is dependent upon the interaction of a number of factors including soil, plant species, stage of maturity, yield, pasture management and climate. Most naturally occurring mineral deficiencies in livestock are associated with specific regions and are directly related to soil characteristics. Sources of minerals for livestock. A large percentage of livestock producers in Latin America do not give their livestock supplemental minerals, with the possible exception of salt. Grazing livestock must therefore depend largely upon forages which only rarely can satisfy completely each of the mineral requirements for grazing animals. Table 2 summarizes the mineral concentrations of 2 615 Latin American forages (McDowell et al., 1974). Borderline or deficient levels of certain elements were noted for many entries: Co, 43 percent; Cu, 47 percent; magnesium (Mg), 35 percent; phosphorus (P), 73 percent; sodium (Na), 60 percent; and Zn, 75 percent. Grazing livestock obtain part of their mineral supply from sources other than forages, particularly from water and soil. Peak soil ingestion is favoured by soils with a weak structure and poor drainage, by high stocking rates, by high earthworm populations, and during the dry season when pasture growth is poor. In New Zealand annual ingestion of soil can reach 75 kg for sheep and 600 kg for dairy animals (Healy, 1974). Direct consumption of large quantities of soil (Figure 1) or bones (Figure 2) is often an indication of a mineral deficiency. Mineral deficiencies and toxicities in Latin America. Mineral deficiencies or excesses in livestock are found and reported to some extent from almost all regions of the world. Table 3 combines recent reviews on the reported incidence of mineral deficiencies or toxicities in Latin America (McDowell, 1976; Fick et al., 1976; McDowell et al., 1977). These reports include both confirmed as well as highly suspected geographical areas of mineral deficiencies and toxicities in ruminants. 1 Latin American Tables of Feed Composition (McDowell et al., 1974; McDowell et al., 1977). 2 Less than 1% of the other minerals were included. 3 N.R.C., 1971, 1976 and A.R.C., 1965. For grazing livestock the most prevalent mineral deficiency throughout the world is lack of P with reports of deficiencies in at least 38 tropical developing countries (McDowell et al., 1977). Next to P, the minerals most likely to be deficient for grazing livestock are Co and Cu (Table 3). Cobalt: Young growing sheep are the most sensitive of all animals to cobalt deficiency; next are mature sheep, calves between 6 and 18 months old, and mature cattle in that order (Andrews, 1956). Cobalt deficiency occurs in many regions of Latin America (Table 3) and mostly, but not exclusively, is restricted to grazing ruminants which have little or no access to concentrates. 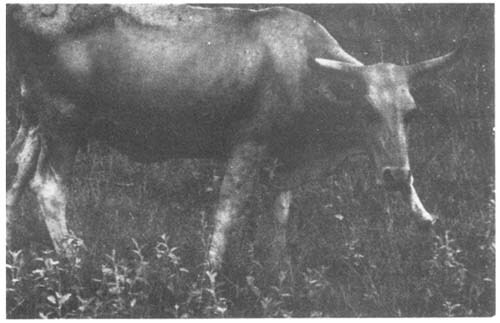 In Brazil Tokarnia and Döbereiner (1973) noted that, except for a lack of P, Co is the most critical mineral (Figure 3 illustrates cobalt-deficient cattle in Brazil). Prior to the recognition of cobalt deficiency, in many parts of the world cattle could be maintained on pastures deficient in Co only if they were periodically moved to “healthy” ground. Incidence of cobalt deficiency can vary greatly from year to year from an undetectably mild deficiency to an acute stage. In five years at Glenroy, Australia, flocks of sheep were unaffected, whereas in another eight years, clinical signs of variable severity of cobalt deficiency were encountered (Reuter, 1975). Cobalt deficiency signs are non-specific and often difficult to differentiate from energy-protein malnutrition. Cobalt-deficient livestock respond quickly to cobalt treatment, recovering appetite, vigour and weight. Cobalt sub-deficiencies or borderline conditions are extremely common and are characterized by low production rates unaccompanied by clinical signs. Cattle and sheep grazing Phalaris tuberosa in areas of Argentina presented the clinical signs of the disease known as “Phalaris staggers”. Cobalt supplementation has been shown to alleviate this condition. Copper and molybdenum: Throughout extensive regions of the world, lack of Cu is a severe mineral limitation to grazing cattle. Copper deficiencies in ruminants, as with Co, occur mainly under grazing conditions, with clinical signs of the deficiency being rare when concentrates are fed (Ammerman, 1970). Copper deficiency is not usually found in pigs and poultry under practical management conditions. Ca Argentina, Brazil, Colombia, Costa Rica, Guatemala, Guyana, Mexico, Panama, Peru, Surinam, Venezuela. Mg Argentina, Brazil, Chile, Colombia, Costa Rica, Guatemala, Guyana, Haiti, Honduras, Jamaica, Peru, Surinam, Trinidad, Uruguay. P Antigua, Argentina, Brazil, Chile, Colombia, Costa Rica, Cuba, Ecuador, Guatemala, Guyana, Haiti, Honduras, Jamaica, Mexico, Nicaragua, Panama, Paraguay, Peru, Puerto Rico, Surinam, Uruguay, Venezuela. K Brazil, Haiti, Panama, Venezuela. Na Brazil, Colombia, Guatemala, Panama, Surinam, Venezuela. Co Argentina, Brazil, Colombia, Costa Rica, Cuba, El Salvador, Guyana, Haiti, Mexico, Nicaragua, Peru, Surinam, Uruguay. Cu (or Mo toxicity) Argentina, Brazil, Colombia, Costa Rica, Cuba, Guyana, Haiti, Mexico, Panama, Peru, Surinam, Uruguay. I Antigua, Argentina, Bolivia, Brazil, Chile, Colombia, Costa Rica, Ecuador, Guatemala, Haiti, Nicaragua, Paraguay, Peru, Uruguay. Fe Brazil, Costa Rica, Panama. Mn Argentina, Brazil, Costa Rica, Panama. Se Bahamas, Brazil, Costa Rica, Ecuador, Guyana, Honduras, Mexico, Paraguay, Peru, Uruguay. Zn Argentina, Brazil, Costa Rica, Guyana, Panama, Peru, Puerto Rico, Venezuela. Mn Brazil, Costa Rica, Peru, Surinam. Se Argentina, Brazil, Chile, Colombia, Ecuador, Honduras, Mexico, Peru, Puerto Rico, Venezuela. Sources: McDowell (1976); Fick et al., (1976). Ward (1977) categorized copper deficiency into four groups where the feed contained: high levels of Mo (more than 20 ppm); low Cu but significant amounts of Mo (i.e., ratio 2:1); deficient in Cu (less than five ppm); and normal Cu and low Mo, with high levels of soluble protein. It is suggested that the latter situation is the result of high intakes of soluble protein from fresh pasture which increases the amounts of sulphide produced in the rumen, thus resulting in unavailable copper sulphide. Fick et al. (1976) reported low copper tissue (liver or blood) levels for ruminants in Argentina, Brazil, Costa Rica, Cuba, Panama and Peru. Since 1975 researchers at the Instituto Colombiano Agropecuario (ICA) have been analysing liver and forage samples throughout Colombia. Their results indicate that copper deficiencies appear to be borderline-to-deficient over vast areas of Colombia (A. Gil and J. Tritschler, 1977, personal communication). Recently certain areas of El Salvador are reported to be likewise deficient in Cu (F. Perla, 1977, personal communication). Twenty-three percent of cattle livers from 12 San Carlos ranches (Kiatoko et al., 1976) and 40 percent from 15 Guanacaste ranches (Lang et al., 1976) analysed in Costa Rica were borderline-to-deficient in Cu. A copper content in feed over 20 ppm can cause chronic poisoning in sheep. Also, it is suggested that normal Cu combined with such low levels of Mo and sulphate (SO4) may result in copper toxicity of sheep. In reviewing copper toxicity, Todd (1969) concluded that chronic copper toxicity in ruminants is almost entirely confined to sheep. Clinical signs of molybdenum toxicity are similar to copper deficiency. Both molybdenum toxicity and copper deficiency are generally corrected by providing additional Cu in the animals' diet. In severe molybdenum-toxic areas, injections of copper compounds are often the preferred method of administration since the primary site for Cu × Mo interaction is the gut (Suttle and Field, 1974). Iodine: Iodine deficiency as manifested by endemic goitre is one of the most prevalent deficiency diseases, having been shown to occur in almost every country of Latin America. Incidence of iodine deficiency has declined in many countries as a result of the widespread use of iodized salt. However, in Latin America endemic goitre remains an exceedingly serious human and livestock problem. Figure 4 shows goitre in a calf in Mato Grosso, Brazil. Iodine is a constituent of the hormone thyroxine, which regulates metabolic rate in animals; thus iodine, through this mechanism, has a strong influence on livestock growth and reproduction. In iodine-deficient areas, deficiency signs are most frequently observed in young animals in the form of: goitre at birth or soon thereafter; death or weakness at birth; hairlessness at birth (typical in pigs); and infected navels (especially in foals). Iodine deficiency in female breeding animals results in oestrus suppression, and in the male lack of libido. Although iodine deficiency is caused primarily by low dietary intake of I, its incidence is greatly enhanced by intake of goitrogens that interfere with iodine utilization (Underwood, 1977). The net effect of goitrogens in most instances is to increase the iodine requirement. The most effective method of goitre prevention is to provide I in the mineral mixture. - Unstabilized potassium iodine is less effective under wet tropical conditions since I in this form is readily volatilized or leached. Calcium (Ca) or potassium iodate, stabilized potassium iodine, or pentacalcium orthoperiodate are much more stable forms of I.
Selenium: Consumption of feedstuffs containing both toxic (> five ppm) and deficient (< 0.1 ppm) concentrations of Se presents a worldwide problem to livestock. Table 3 presents Latin American countries where selenosis or selenium deficiency is encountered or suspected, and Figure 5 illustrates selenium toxicity in Colombia. Much of the older literature from Latin America dealt with selenium toxicity; however, with improved techniques of analysis and detection, recent research indicates selenium deficiency to be widespread. Since 1957 an interrelationship between Se and vitamin E has been established. During the past ten years, death losses due to Se-vitamin E deficiencies have occurred with increasing frequency in pig and poultry operations characterized by complete confinement with little or no use of pastures. As the trend toward confinement and absence of pastures increases in Latin American pig and poultry operations, the incidence of Se-vitamin E deficiency is likely to increase. In grazing animals three distinct selenium deficiency syndromes have been described: “white muscle disease” (WMD) in newborn or young lambs and calves; unthriftiness, with poor growth rates, which may occur in the absence of any other recognizable disease; and infertility. Lang et al. (1976) reported borderline-to-deficient selenium concentrations in 33 percent of the livers analysed from beef cattle slaughtered in Guanacaste, Costa Rica. Low selenium concentrations have been reported in forages in areas of Chihuahua, Mexico and Guyana (Fick et al., 1976). In Peru a condition in ruminants resembling Se-vitamin E deficiency is reported. 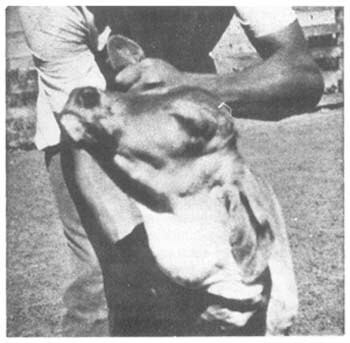 When the animals were treated with Se-vitamin E injections, about 70 percent recovered from the condition (Terry, 1964). Selenium poisoning is often associated with consumption of selenium accumulator plants (for example. Astragalus spp.) which may contain up to several thousand ppm Se. At present practical measures for controlling selenium poisoning of grazing livestock rely on pasture rotation and the use of feeds from non-seleniferous areas. Locating seleniferous soils and mapping them in sufficient detail are essential. The selenium content is highest in young plants and declines rapidly at later stages of maturity. Therefore, use of pastures of low selenium content during the growing season and high selenium forages toward the end of the growing season is a very effective control measure. Fluorine: Although apparently essential for most species, only the toxic effects of F are likely to be of importance to livestock. Fluorine is an accumulative element with fluorosis found in many parts of the world. 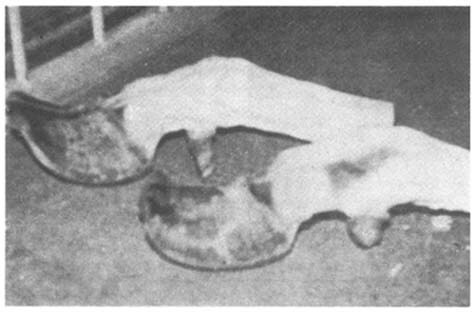 Chronic fluorosis in livestock is generally observed under three conditions: drinking water high in F; continuous consumption of high F mineral supplements; and grazing fluorine-contaminated forages adjacent to industrial plants which emit fluorine fumes or dust (Underwood, 1977). The fluorine content of common forages seldom reaches more than one to two ppm, since most plants have a limited capacity to absorb this element. Certain levels of fluorine intake are tolerated by livestock for prolonged periods without any measurable decline in growth, appetite, well-being, fertility, or productivity, despite elevated bone fluoride levels and mild dental and skeletal abnormalities. Toxicity of F is a reflection of amount and duration of ingestion, solubility of fluorides ingested, age of animal, nutrition, stress factors, and individual animal differences. Cattle are less tolerant to fluorine toxicity than other livestock, those in tropical countries provided with inadequate supplies of energy and protein during extended dry seasons being particularly susceptible. (Photo courtesy of A. Velasco. Hato El Frío, Apure State, Venezuela). (Photo courtesy of David Morillo, Centro de Investigaciones Agronómicas, Maracay, Venezuela). (Photo courtesy of Jürgen Döbereiner and Carlos H. Tokarnia, EMBRAPA, Rio de Janeiro, Brazil). (Courtesy B.D.H. Van Niekerk, Voermol Products Limited, Natal, South Africa). Prevention of fluorosis in Latin America should include analyses of water supplies and phosphates for fluorine content. Lactating cows can tolerate 30 ppm with no apparent difficulty, 40 ppm is a marginal tolerance, and 50 ppm can result in fluorosis within three to five years (NAS, 1974). Only defluorinated phosphates (< 100 ppm) should be given as a supplement to livestock; feeding fertilizer rock phosphate should be avoided. Iron: Natural feedstuffs usually contain enough Fe to meet the requirements of farm livestock. The notable exception is the baby pig, where iron deficiency is common because placental and mammary transfer are inadequate and milk is very low in this element. In operations where pigs are kept on concrete without access to soil or pasture, iron deficiency anaemia will often result within two or three weeks unless a supplemental source of Fe is available. Except in animals with severe parasitism or haemorrhaging, iron deficiency is considered rare for grazing livestock owing to generally adequate pasture concentrations together with contamination of plants by soil. Iron supplementation is most warranted for grazing livestock when forages contain less than 100 ppm Fe or insects or parasites are causing substantial blood loss. Zinc: Since the middle 1950s the importance of Zn in pig and poultry diets has been realized. It was established that a skin disorder in pigs termed parakeratosis could be prevented by supplemented Zn. Excess Ca in the diet hastens the onset of parakeratosis. Since parakeratosis is not entirely absent even in diets containing less than 1.0 percent Ca, Zn should be regularly added to most diets for pigs and poultry in confinement. Zinc deficiency in cattle was once thought unlikely under practical conditions. Zinc deficiencies, evidenced largely by skin disorders and reduced performance, have been reported under natural conditions in Guyana, Finland, Norway, United States, Republic of South Africa (Figure 6) and Venezuela (McDowell et al., 1977). 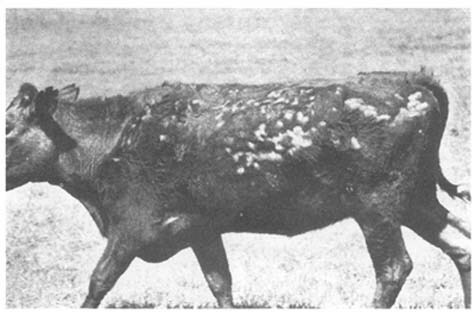 Legg and Sears (1960) demonstrated a parakeratosis skin disorder in cattle of Guyana which were consuming forage containing 18 to 42 ppm Zn. 1 References for critical levels: McDowell (1976). Manganese: Manganese deficiency is seldom encountered in ruminants and pigs fed diets composed of natural ingredients. A deficiency in poultry is more common due to the higher requirement for this element. Manganese deficiency in beef cattle results in delayed oestrus and conception, and calves born with neonatal skeletal abnormalities (Rojas et al., 1965). Low manganese forages have been reported in the following Latin American countries: Argentina, Brazil, Costa Rica and Panama. Low liver manganese levels suggestive of a manganese deficiency were noted in 63 percent of the cattle examined in western Costa Rica (Lang et al., 1976). Clinical signs suggestive of a manganese deficiency have also been reported from this region (Lang, C.E., 1977, personal communication). In a different region of Costa Rica, characterized by volcanic soils, manganese toxicity was observed which resulted in low reproductive rates of cattle (Fonseca and Davis, 1968; Lang, 1971). Detection of mineral deficiencies or toxicities. The most reliable method of confirming mineral deficiencies is response derived from specific mineral supplementation. The majority of mineral imbalances, particularly borderline conditions, do not result in clinical signs specific to a single mineral. Soil mineral analyses can sometimes provide clues to livestock mineral deficiencies, but more often they are unreliable and difficult to interpret. A major disadvantage of forage element analyses to assess mineral adequacy for grazing livestock is the uncertainty of samples representing what livestock consume. Nevertheless, forage mineral analyses are preferable to soil analyses, while animal tissue analyses most accurately portray the contribution of the total environment (forage, soil, and water) to meeting livestock mineral requirements. Recently excellent reviews have discussed methods of chemically diagnosing mineral deficiencies. Since mineral analyses are complicated and expensive, it is important to select and analyse the minimum number of plant and animal tissues which are most indicative of the mineral status. Table 4 illustrates analyses of considerable value in assessing specific mineral deficiencies and toxicities in cattle. Present knowledge of trace element imbalances in livestock is derived from the study of a few geographical areas, and there is no way to predict which trace element problems may exist in the remaining vast territories not yet investigated (Mertz, 1976). It is therefore important to implement a systematic method to locate mineral imbalances in Latin America and other developing regions. A technique for mapping potential areas of mineral deficiencies and toxicities. Mineral deficiencies or toxicities in grazing livestock can be predicted by use of a systematic mapping survey technique or regional reconnaissance. Egan (1975) reports that the sampling and analysis of stream bed sediments have revealed areas of hitherto unsuspected molybdenum-induced copper deficiency in sheep and cattle, manganese deficiency in cattle and cobalt deficiency in sheep. Kubota (et al., 1967, and 1968) analysed selenium and cobalt levels of U.S. forages for the purpose of relating concentrations of these to selenium-and cobalt-responsive diseases of livestock. Similar mapping techniques based on mineral forage analyses have been completed in Brazil and Venezuela. Likewise, a mapping technique based on specific mineral concentrations in animal tissue has also been undertaken in Brazil, Venezuela and Panama (McDowell, 1976). Since 1974 the University of Florida, with financial support from the U.S. Agency for International Development, has been engaged in cooperative mineral research with institutions in ten Latin American countries (Fick et al., 1976). The purpose of this research is also to locate mineral deficiencies or excesses in ruminants by use of a systematic mapping technique which analyses plant and animal tissues and by observing the biological response from mineral supplementation trials. Mineral supplementation for livestock. The most devastating economic result of mineral deficiencies is reproductive failure, with mineral supplementation dramatically increasing fertility levels in grazing cattle from many parts of the world (McDowell, 1976). Table 5 illustrates reports from Latin American countries where the calving percentage was increased by mineral supplementation. The specific mineral or minerals responsible for increasing reproductive performance in the above experiments is unclear. Phosphorus probably contributed most to this improvement. Nevertheless, bone meal as a source of P is likewise often a good source of essential trace elements. For monogastric animals, minerals can best be provided by inclusion of the required elements in the concentrate mixture. This is most critical if monogastrics are housed in complete confinement without access to pasture. difficulties involved with transportation, storage and cost of mineral supplements. Despite the dramatic effects of bone meal on weight gains and pregnancy rates, Bauer (1968) suggested that the high cost of transportation eliminated the profitability of bone meal supplementation in the Llanos of Bolivia. Additional observations, however, have indicated that supplemental bone meal increased the calving percentage and weight gains substantially, thereby making supplemental bone meal economically profitable in the Beni State of Bolivia (Bauer, B., 1976, personal communication). In order to evaluate a mineral supplement for ruminants, it is necessary to have an approximation of: the requirement for each element: the biological availability of the element in the compounds supplied: the daily intake per head of both mineral mixture and total dry matter; and the concentration of elements in the mineral mixture (Houser et al., 1977). Table 6 presents an example of mineral allowances and proportions supplied by a mineral mixture (typical in Latin America) offered “free choice” on range or pasture. This particular mixture supplied only 5 percent of the zinc requirement and relatively low quantities of Cu, Fe and Mn. Bolivia 67.5 280.8 Bauer (1976, unpublished data). Brazil 55.0 277.0 Conrad and Mendes (1965). Brazil 49.0 272.0 Guimarães and Nascimento (1971). Brazil 25.6 247.3 Grunert and Santiago (1969). Colombia 50.0 384.0 Stonaker (1975). Panama 62.2 468.8 Ríos Araúz (1972). Panama 42.0 280.0 Poultney (1972, personal communication). Peru 25.0 575.0 Echevarría et al., (1974). Uruguay 48.0 264.0 De León Lora (1963). Uruguay 86.9 296.4 Schiersmann (1965). 1 Control animals received only common salt (NaCl). 4 Dicalcium phosphate + triple superphosphate. 5 Dicalcium phosphate + copper sulphate. An acceptable mineral supplement should provide a “significant portion” of the requirement for each mineral, it being generally believed that this figure should be at least 25 to 50 percent. In known trace mineral deficient regions it may be desirable to provide 100 percent of specific elements required, especially in areas where they are known to be low in forages (Ammerman, 1977). As a low-cost insurance to provide adequate mineral nutrition, “complete” mineral supplements should be available “free choice” to ruminants (Cunha et al., 1964). A “complete” mineral mixture should include salt, a low fluoride phosphorus source, Ca, Co, Cu, I, Mn and Zn. Selenium, Mg, K, S, Fe or additional elements can be incorporated into a mineral supplement as new information suggests a need. Calcium, Cu or Se when in excess can be more detrimental to ruminant production than any benefit derived by providing a mineral supplement. In regions where high forage Mo predominantes, three to five times the copper content in mineral mixtures is needed to counteract molybdenum toxicity (Cunha et al., 1964). Data from Florida (Becker et al., 1965) and Montelonia, Colombia (Gil, A., 1975, personal communication), show that salt content of water supplies is important in formulating mineral supplements since cattle consume less minerals when water is high in salt. The economic return on mineral investment has been at least two to one in some studies (Conrad, 1976). 1 N.R.C., 1971, 1976 and A.R.C., 1965 recommendations. 2 Composition similar to certain mineral mixtures available in tropical countries. 4 Magnesium is generally not added except for special mixtures for lush winter or spring grazing of tetany-prone pasture. Ammerman, C.B. 1970. Recent developments in cobalt and copper in ruminant nutrition. A review. J. Dairy Sci., 53: 1097–1107. Andrews, E.D. 1956. Cobalt deficiency. N.Z. J. Agric., 92: 239–244. Agricultural Research Council. 1965. The nutrient requirements of farm livestock. Ruminants. London. Agricultural Research Council, No. 2. Bauer, B. 1968. Problemas de la cría de ganado vacuno de carne en el trópico de Latinoamérica (Bolivia y medidas que hemos adoptado para solucionarlos). II. Conf. Anual de Ganado de Carne en América Latina, Univ. of Fla., Gainesville, 1: 36–51. Becker, R.B., Henderson, J.R. & Leighty, R.B. 1965. Mineral malnutrition in cattle. Gainesville, Florida Agricultural Experiment Station. Bulletin 699. Conrad, J.H. 1976. Phosphorus supplementation for increasing reproduction in cattle. Ruminant Livestock Production System, Guyana, 1 March 1976. Conrad, J.H. & Mendes, M.O. 1965. Estudo comparativo do uso de suplementos minerais e fonte de proteína sobre a percentagem de nacimento de bezerros. Report of Escritório Técnico de Agricultura, Brazil, a Granja. Revista dos Criodores, Brazil. Cunha, T.J., Shirley, R.L., Champman, H.L. Jr., Ammerman, C.B., Davis, G.K., Kirk, W.G. & Hentges, J.F. 1964. Minerals for beef cattle in Florida. Gainesville, Florida Agricultural Experiment Station. Bull. 683. Echevarría, M., Valdivia, R., Barúa, J., Santhirasegaram, K. & Campos, L. 1974. Suplementación fosforada a vaquillas nellore. ALPA Memoria, 9. Egan, A.R. 1975. The diagnosis of trace elemént deficiencies in the grazing ruminant. In Trace elements in soil-plant-animal systems, p. 371–384. New York, Academic Press. Fick, K.R., McDowell, L.R. & Houser, R.H. 1976. Current status of mineral research in Latin America. Latin American Symposium on Mineral Nutrition Research with Grazing Ruminants, 22–26 March, Belo Horizonte, Brazil, p. 261–292. Fonseca, H.A. & Davis, G.K. 1968. Manganese content of some forage crops in Costa Rica and its relation to cattle fertility. Proc. 2nd World Conference on Anim. Production. St. Paul, Minn., Bruce Publishing Co.
Grunert, E. & Santiago, C. 1969. Uber den Einfluss von Knochenfuttermehl auf die Fruchtbarkeit von Fleischrindern in Rio Grande do Sul. Brasilien Zuchthyg., 4: 65. Guimarães, J.M.A. & DO Nascimento, C.N.B. 1971. Effect of mineral supplement on calving percentage in beef cattle herds on the island of Marajó. Instituto de Pesquisas e Experimentação Agropecuárias do Norte. Estudos sobre Bovinos, 1(2): 37–51. Healy, W.B. 1974. Ingested soil as a source of elements to grazing animals. Trace Element Metabolism in Animals. 2. Baltimore, Md., University Park Press. Kiatoko, Mangeye, McDowell, L.R., Fick, K.R. Fonseca, H., Camacho, J.A., Loosli, J.K., Conrad, J.H. & Houser, R.H. 1976. Mineral status of cattle in San Carlos, Costa Rica. J. Anim. Sci., 43: 328. Kubota, J. 1968. Distribution of cobalt deficiency in grazing animals in relation to soils and forage plants of the United States. Soil Sci., 106: 122–130. Kubota, J., Allaway, W.H., Carter, D.L., Cary, E.E. & Lazar, V.A. 1967. Selenium in crops in the United States in relation to selenium-responsive diseases of animals. J. Agric. Fd Chem., 15: 448–453. Lang, Carlos E., McDowell, Lee R., Conrad, Joe H. & Fonseca, Hernán, 1976. Estado mineral del ganado en Guanacaste, Costa Rica. ALPA Memoria, 11: 79–80. Legg, S.P. & Sears, L. 1960. Zinc sulphate treatment of parakeratosis in cattle. Nature, Lond., 186: 1061–1062. McDowell, Lee R., 1976. Mineral deficiencies and toxicities and their effect on beef production in developing countries. Proc. 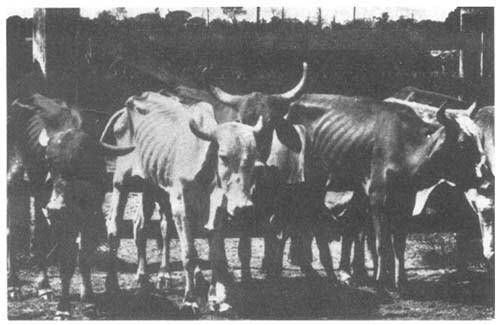 Beef Cattle Production in Developing Countries, Edinburgh, Scotland, p. 216–241. McDowell, Lee R., Conrad, Joe H., Thomas, Jenny E. & Harris, Lorin E. 1974. Latin American Tables of Feed Composition. Gainesville, Fla., University of Florida. Mertz, W. 1976. Trace elements in animal nutrition. Proc. Nuclear Techniques in Animal Production and Health, International Atomic Energy Agency, Vienna, p. 3–15. National Academy of Sciences. 1974. Effects of fluorides in animals. Washington, D.C.
National Research Council. Nutrient requirements of domestic animals. 1971a. No.1. Nutrient requirements of poultry. Washington, D.C.
National Research Council. Nutrient requirements of domestic animals. 1971b. No.3. Nutrient requirements of dairy cattle. Washington, D.C.
National Research Council. Nutrient requirements of domestic animals. 1976. No.4. Nutrient requirements of beef cattle. Washington, D.C.
National Research Council. Nutrient requirements of domestic animals. 1973. No. 2. Nutrient requirements of swine. Washington, D.C.
National Research Council. Nutrient requirements of domestic animals. 1975. No. 5. Nutrient requirements of sheep. Washington. D.C.
Reuter, D.J. 1975. The recognition and correction of trace element deficiencies. In Trace elements in soilplant-animal systems. p. 291–324. New York, Academic Press. Rojas, M.A., Dyer, I.A. & Cassatt, W.A. 1965. Manganese deficiency in the bovine. J. Anim. Sci., 24: 664–667. Schiersmann, G.C.S. 1965. Ejecto de la suplementación con fósforo sobre la eficiencia reproductíva y crecimiento de un hato de ganado Hereford en praderas naturales del Uruguay. Instituto Interamericano de Ciencias Agrícolas, La Estanzuela, Colonia, Uruguay. (Thesis). Stonaker, H.H. 1975. Beef production systems in the tropics. I. Extensive production systems on infertile soils. J. Anim. Sci., 41: 1218–1227. Sutmöller, P., Vahia de Abreu, Ant., Van der Grift, J. & Sombroek, W.G. 1966. Mineral imbalances in cattle in the Amazon Valley. Amsterdam, Department of Agriculture Research, Royal Tropical Institute. Communication No. 53. Suttle, N.F. & Field, A.C., 1974. The effect of dietary molybdenum on hypocupraemic ewes treated by subcutaneous copper. Vet. Rec., 95: 165. Terry, T. 1964. Tratamiento de la coquera en vacunos mediante la inyección intramuscular de selenio y vitamina E. Anales del II Congreso Nacional de Medicina Veterinaria y Zootecnia, Lima, Perú, p. 163. Todd, J.R. 1969. Chronic copper toxicity of ruminants. Proc. Nutr. Soc., 28: 189–198. Tokarnia, Carlos H. & Döbereiner, Jürgen. 1973. Diseases caused by mineral deficiencies in cattle raised under range conditions in Brazil. A review. Pesq. Agropec. bras., Sér. Vet., 8 (Supl. ): 1–6. Underwood, E.J. 1977. Trace elements in human and animal nutrition, 4th ed. New York, Academic Press.